Range Search is a very basic alogorithm used in multiple situations, like out of a set of 100 employees, find all whose salary falls between a specific range. As we are talking about sigle aspect (salary), we will use a 1-D range serach approach to solve this problem. 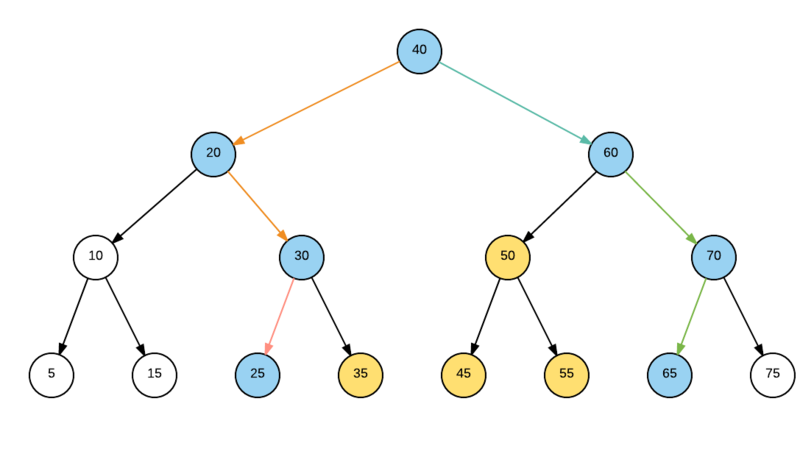 A simple algorithm would use a Balanced binary serach tree, with property that all the nodes in left subtree are smaller than root node and all right subtree node are higher, for any subtree. The balancing property make sure all the root nodes are at a distance on X or X-1, where X is order of lg(N), N being nodes in tree. Lets say the number represent salary of employess in thousands. And the range we need to find is say 23 and 63. We will traverse tree for both lower and upper bound. Orange arrows signifies traversal for 23 and Green ones show traversal for 63. This leaves us with three type of nodes. 3. Node lying between traversal path (Yellow nodes)- these are in range. This entry was posted in Algorithms and tagged Algorithms on October 20, 2015 by admin.